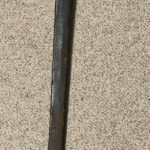 This sword is apparently from the 1700s (i.e. 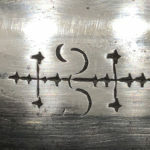 18th Century). 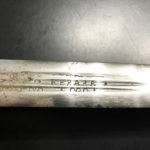 One collector feels that the blade is circa 1720 and the hilt circa 1780. 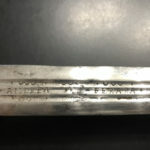 Sadly there is no provenance (history) with this sword as is so often the case. 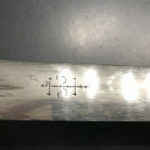 The fact that it still has its scabbard is a rarity. Research is ongoing. My MacGregor, McKay, MacDonald etc. 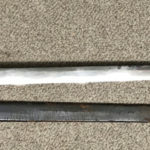 highland ancestors would have carried swords like this one. 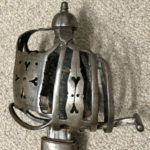 The basket-hilt was very popular in the 1600s and 1700s and replaced the big two handed swords. There were two basic types. 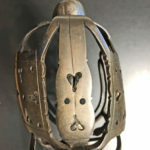 A double-edged basket-hilted sword was called a “broadsword.” A single edged basket-hilted sword was called a “backsword.” In addition to his sword, a highlander would also carry a targe (pronounced with a hard G) and a dirk. The movie “Braveheart” shows the use of a two-handed sword and the movie “Rob Roy” shows the use of a broadsword. 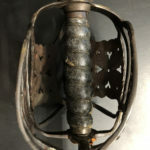 “CULLODEN – The Swords and the Sorrows – An exhibition to commemorate the Jacobite Rising of 1745 and the Battle of Culloden 1746 16 April – 20 September 1996” – Excellent collection of photos, but the descriptions are extremely technical and are written for expert sword collectors.